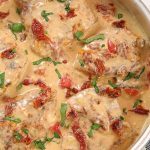 Creamy sun-dried tomato chicken is creamy, delicious, contains garlic and has a super yummy tart taste from the dehydrated tomatoes. The sun-dried tomatoes is what makes this dish packed with ton of flavor but without a ton of ingredients. Using the oil from the jarred tomatoes can really enhance the flavors and color to the dish as some sun-dried tomatoes are seasoned and packed in oil, so I highly recommend to use up some of that oil. This dish is so good it can probably still be good without the addition of chicken (the sun-dried tomatoes are really the flavor booster here.) A must make recipe! 1. Drain tomatoes; coarsely chop and reserve all the oil. Set aside. 2. Sauté the garlic and sun-dried tomatoes in 2 tbsp of the reserved oil until fragrant (1-2 min.) Remove. 3. Season both sides of the chicken with paprika, salt and pepper to taste. Add 1 tbsp of the reserved sun-dried tomato oil to the frying pan and fry chicken on both sides until done. Remove; chop and set aside. 4. In the same skillet add 1 tbsp of butter, and 2 tbsp of sun-dried oil. Whisk in the flour and gradually add in the half & half and water. Once bubbly and slightly thickened add in the cheeses. Thin out sauce with more water for desired consistency, if needed. 5. Add in the chicken pieces, garlic & tomato saute back to the pan and heat through. Top over pasta. Drain tomatoes; coarsely chop and reserve all the oil. Set aside. Sauté the garlic and sun-dried tomatoes in 2 tbsp of the reserved oil until fragrant (1-2 min.) Remove. Season both sides of the chicken with paprika, salt and pepper to taste. Add 1 tbsp of the reserved sun-dried tomato oil to the frying pan and fry chicken on both sides until done. Remove; chop and set aside. In the same skillet add 1 tbsp of butter, and 2 tbsp of sun-dried oil. Whisk in the flour and gradually add in the half & half and water. Once bubbly and slightly thickened add in the cheeses. Thin out sauce with more water for desired consistency, if needed. Add in the chicken pieces, garlic & tomato saute back to the pan and heat through. Top over pasta.